Week 4 of Shauna Hicks challenge for 2014. This blog challenge is to stimulate my own genealogy blogging efforts in 2014 by focusing on a different kind of genealogical record each week. I wanted a challenge that reflected my own archival background as well as my own genealogy interests and there are probably lots of other records that I could have included. The challenge has an Australian focus but most of these records will be found just about anywhere in the genealogy world. This weeks challenge is Memorial Cards. I am fortunate to have three memorial cards and the original photographs which were used in these cards in my possession, each coming from my husband's family. Shauna's post set her off in the direction of finding out how the little boy died. However, as I know the life stories of these three people I have decided to investigate the company which produced these cards. 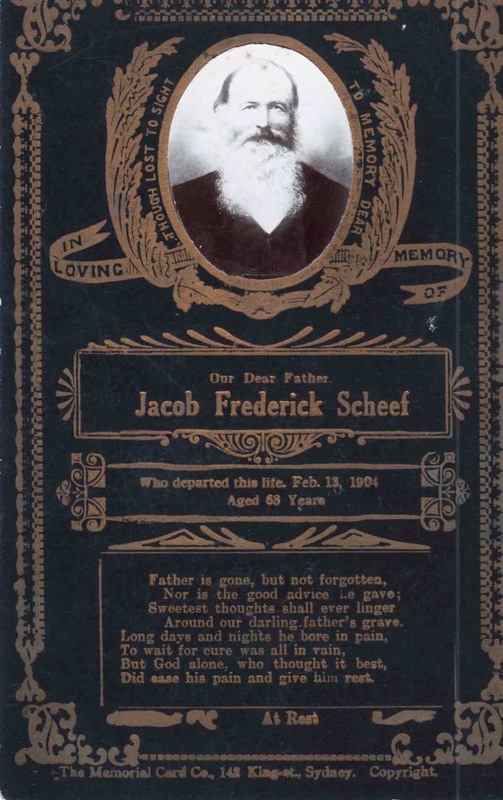 Jacob Scheef's card (1904) was produced by The Memorial Card Co, 142 King Street, Sydney. 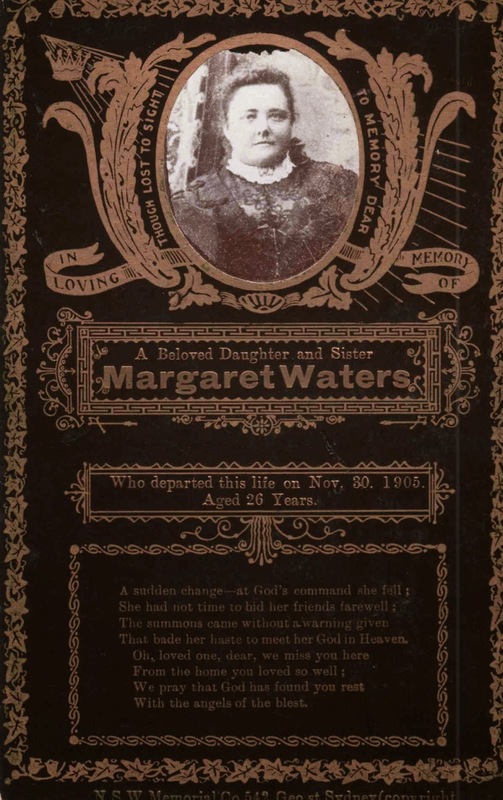 Margaret Water's card (1905) was produced by NSW Memorial Co, 542 Geo Street, Sydney. 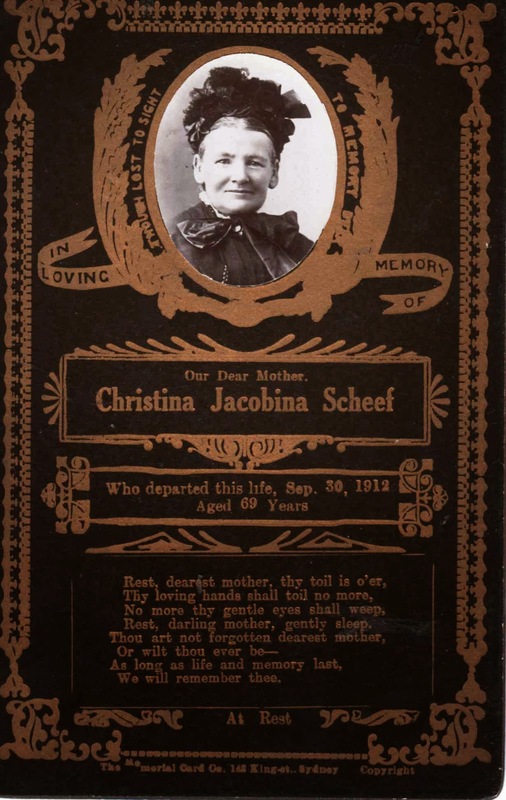 Christina Scheef's card (1912) was produced by The Memorial Card Co, 142 King Street, Sydney. 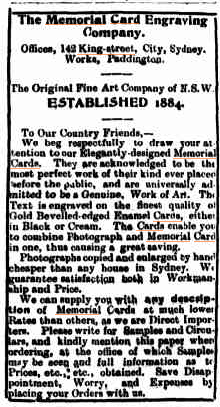 Advertisements can be easily found on Trove in the Freeman's Journal, The Catholic Press, The Australian Town and Country Journal and country newspapers. It is interesting to note the differences between the two selected advertisements. The first in the Freeman's Journal stresses the fact that the cards have been approved by the Church and includes appropriate prayers. 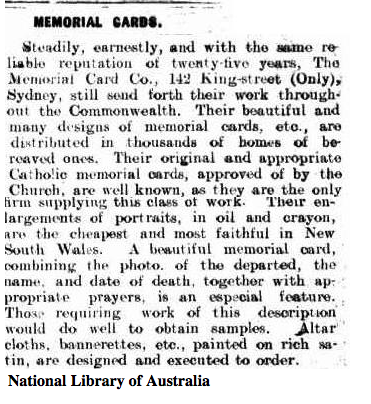 The seconds states their memorial cards are a genuine work of art. Different wording for different audiences. What a great collection of memorial cards, wishing I had more than one! Now most of companies are allowing to design your own memorial card via online. Do you know that? I found this Site today when searching for some Used books and noticed they had a site set up for funeral/memorial cards. Nice old collection you have.